— One of the world’s most prominent Protestant leaders is in Detroit this week, preaching that Christianity is vital for democracy, human rights and fulfilling the human soul. But in order for the Christian faith to survive in the West, it needs to reach out and help society or face continued decline, he said. Lord George Carey, a former Archbishop of Canterbury, was once the nominal head of about 80 million Anglicans worldwide, the third-largest Christian group after the Catholic Church and the Eastern Orthodox Church. 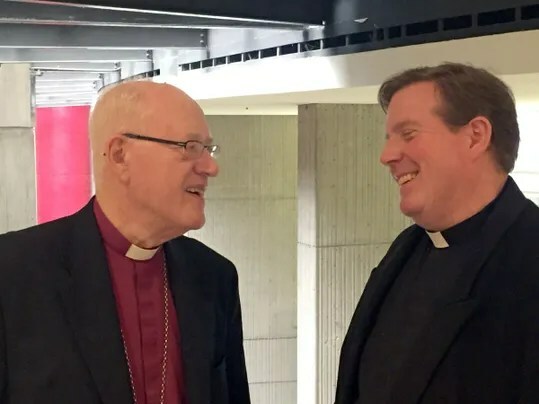 Known for his conservative views, Lord Carey on Wednesday delivered the opening prayer to the state Senate in the Capitol and will speak this weekend at St. John’s Episcopal Church in Detroit, the house of worship near Comerica Park that is hosting him. Speaking to the Free Press, Carey called for Christian churches to be more responsive to the needs of communities to remain relevant. His visit comes the same week that a major new report by Pew Research Center was released, showing that the number of Americans identifying as Christian dropped eight percentage points, from 78.4% to 70.6%, since 2007 – or about five million people. The drop was especially sharp among mainline Protestants, which include Episcopalians, an American denomination that is part of the Anglican Communion. In the Episcopal Diocese of Michigan, Sunday attendance has declined more than 35% since 2000. The fading of Christianity concerns Carey, once described as the Pope Emeritus of conservative Anglicans all over the world. “Christianity is integral to our democracy” and human rights, said Carey, who led the Church of England from 1991 to 2002. “People make the assumption that Western democracy is based upon the principles of the Enlightenment,” but it comes from Christianity. Carey will speak at St. John’s Episcopal Church, a historic church that has made a comeback over the past dozen years under the Rev. Steven Kelly, who does a more traditional liturgy. Their spike in membership at a time of Episcopal decline shows that traditional views could help stem the decline of Christianity, say church members. While mainline Protestants suffered the greatest loss in membership over the past seven years, evangelical Christians grew by two million, according to the new Pew report. Instead, churches should be engaging people where they are: from sports to community affairs to every day activities. “The church is relevant to society in a big way,” he said. The Rev. Kelly said: “People are seeking meaning in sexuality, they’re seeking meaning in sports, they’re seeking meaning in all sorts of things, but that doesn’t fill the God-sized hole” in people’s souls that religion can. Inspired by the social movements at the time, Jeannette Salters of Detroit got involved in the early 1970s with African-American and feminist causes, helping lead a black women’s group. That led her to discover her roots in west Africa, where she eventually settled in Ghana, changing her name to Mamelena Diop. Her journey to Africa was part of a movement of Detroiters who sought to reclaim their ancestral roots during a revival of black nationalist movements. Diop loved it there, say friends and family. But this week, her body, along with that of her sister, Nzinga Janna, was found near their home in Ghana in what may been killings in a dispute over land. She was 75 and her sister was 60 at the time of death, according to reports in a Ghanian online news site and family members. Two men have been arrested, according to the Ghanian news report and family members. Salters said his mother and aunt were killed by people who wanted land she had legally acquired from the government in Ghana. “Some locals decided they wanted to take the land from them,” he said. “My mom went to court over that” and won. Her dogs had been poisoned several weeks ago, said family members and the media report. The report said the dispute also may have been over who has the authority to be a chief, with others trying to say that the sisters could not legally be chiefs. But family members in metro Detroit say that story doesn’t add up since the sisters could not be chiefs in that area because they were women. Friends and family of Diop mourned her loss, saying it was a tragedy for her to die in a land she loved so much. Diop had moved back and forth between Detroit and Ghana over the years and was a dual citizen of the U.S. and Ghana. She was last in Detroit two years ago for the funeral of a relative. A family member or friend of Janna could not be reached for comment. Diop’s close friend, Thea Simmons of Grosse Pointe Park, was in shock when she heard about the deaths. Family are now trying to get her body back into the U.S. The U.S. Embassy has contacted them to notify them of the deaths of the sisters, said family members. The family is trying to raise money through GoFundMe to ship the sisters’ remains back to Detroit. Diop was originally from Cleveland, but moved to Detroit as a young woman, said Simmons. She “became involved in radical politics … social movements” in African-American and women’s movements. In 1973, she helped set up the Detroit chapter of the now-defunct National Black Feminist Organization. She was also a social worker and counselor, said family members. Several years later, she traveled to west African countries, the land of her origins. She settled in Ghana, getting involved with helping people, said family members. She was also into eating organic and using natural herbs. “My mother was very articulate, very into herbs and holistic medicine, eating natural,” said Cheryl Salters. A grandson, James Salters, said that Diop was involved with helping Ghanians with education, water systems and affordable housing. — Yemeni Americans say the failure to act is part of a pattern of bias they face from the U.S. government.”They’re treating us like we’re not Americans,” said Mahmoud Ali, a Dearborn resident who has an uncle, brother and cousin who have been stuck in Yemen since March. Click here to read the full story in the Detroit Free Press. And accompanying story about differing views among Yemeni-Americans on the war in Yemen. A BuzzFeed list has named me as one of the Top “100 Must Follow Twitter Accounts On Muslim Affairs.” The global list includes noted writers, scholars, Islamic groups, Muslim leaders from around the world. I’m the only newspaper journalist on the Top 100 list. Click here to see the list. Click on the button below to follow me on Twitter. 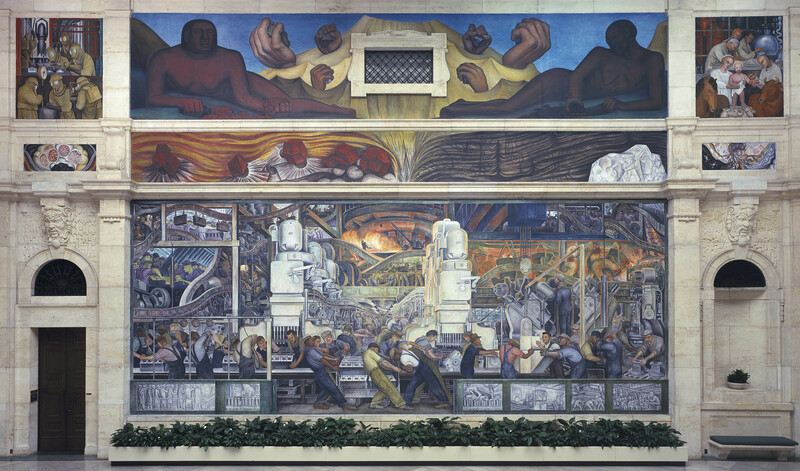 The New York Times compares the Diego Rivera murals in Detroit to the Sistine chapel. Kahlo's "miscarriage she suffered while in Detroit spurred the searing form of self-representation that is her contribution to art history." Jameel Syed, 40, of Auburn Hills is embarking on a 35-day spiritual journey to become the first person to give the adhan, the Muslim call to prayer, in all 50 states. V.S. Naipaul calls for the “”military annihilation” of ISIS, “the most potent threat…since” Nazis. In a new essay, Nobel Laureate V.S. Naipaul says ISIS poses the biggest threat to the world since the Nazis. His essay explores religion and how the modern West developed. Naipaul, who won the Nobel Prize for Literature in 2001, has written two books about the Muslim world, exploring the lives of people in non-Arab Muslim countries. Click here to read V.S. Naipaul’s essay in the Daily Mail.